How are you feeling right now? Just stop for a minute and notice how you feel! Connect to your body and your mind….Do it right now…. Awareness is the first step towards change. Too often we’re on autopilot and don’t even notice what’s going on inside of us. 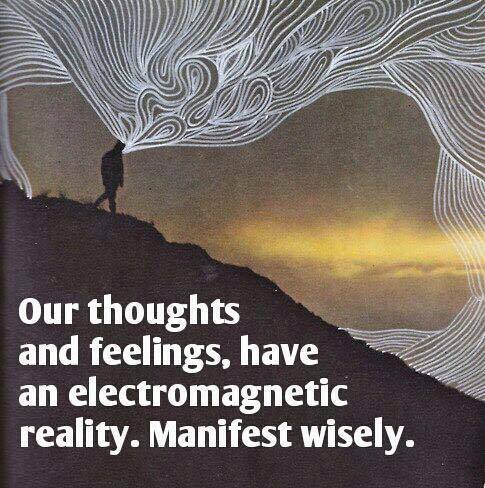 By tuning into our body and feelings, we gain awareness. Notice how you feel, name the feeling, name the thought and the emotion behind it. Become aware, watch, observe, become present. 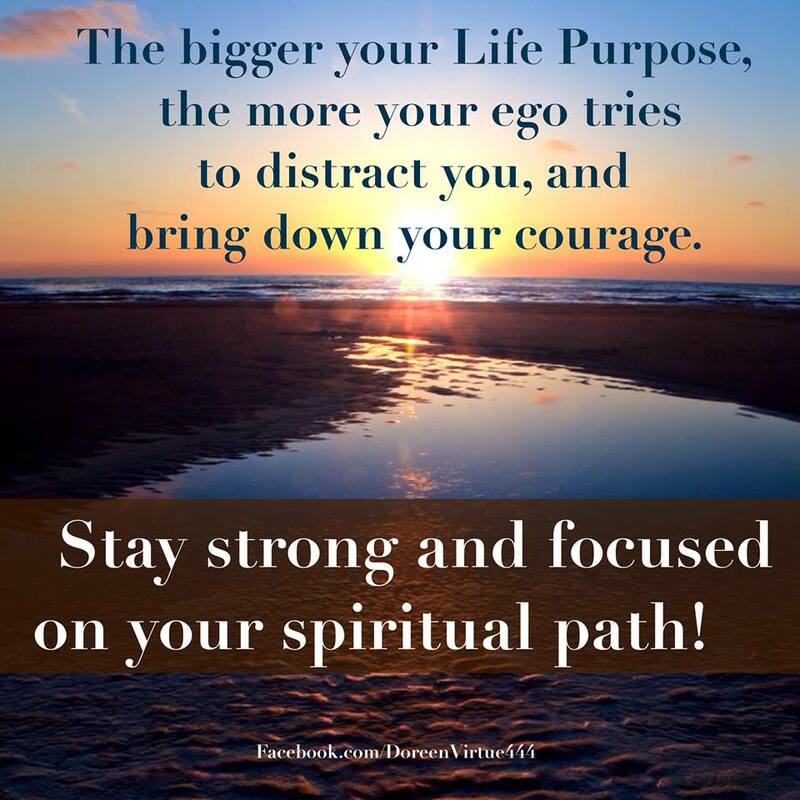 Change your focus from outwards to inwards. When we ignore that inner whisper too long, it becomes a scream but by listening and noticing we can turn the volume back down again. Happy summer holidays. I’m still around if you’re intested in a session. Wishing you a wonderful day filled with positive attention, love and happiness. Is it really June 2017 already? Wow, how did that happen? When you look back at this year so far, can you see how much has changed? Or is it just me 😉 Change is the only thing that never changes. Change is natural, change is beautiful, some resist it, some embrace, some fear it, some call it challenges but it’s actually just change. And, we influence it: we can choose our reaction to it, we can welcome it rather than cursing it. We can believe that things will all work themselves out eventually. Most challenges turn into blessings. We see them as challenges because we haven’t found the lesson in them yet. Everything in life has two sides, look out for the positive in any change that happens. Start by being grateful. Affirm that everything happens for a reason. You and your life will continue to change. If you start counting your blessings, you can direct that change, influence it and become it. A grateful person is a happy person. 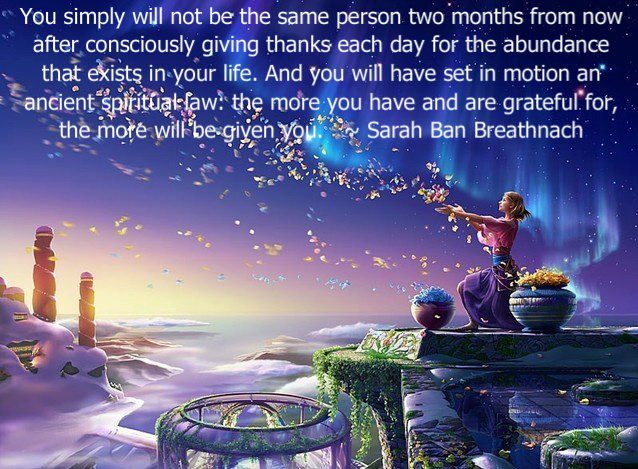 You simply will not be the same person two months from now after consciously giving thanks each day for the abundance that exists in your life. 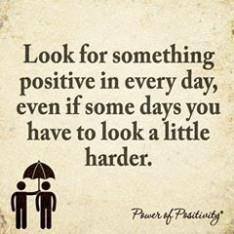 Look for something positive in every day, even if some days you have to look a little harder. Set yourself reminders to do this, perhaps on your phone or have visual reminders around your workplace or home. Stop every couple of hours, take a few deep breaths and find something to appreciate about yourself, your day, the people around you or whatever comes to mind. 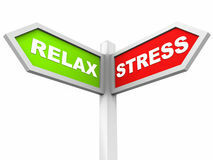 This not only helps to reduce stress but also provides you with energy. Positive people are generally happier, healthier and more vibrant. 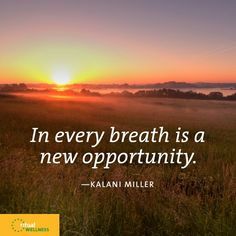 Look for the blessing in every so-called challenge and turn it into an opportunity. By focusing on positive things, your mood will be much better and you might just stumble over a solution, yet you have to be calm and solution-focused for this to happen. Finally, if you want to consciously change your life for the better, forget about your to-do list every now and then, leave the cleaning, tidying and many other chores for another day and do more of what makes you happy. Your children, friends and family would surely prefer a happier you over a clean house. Be happy, spread hope, enjoy the moment, that’s what people will remember about you. To turn a challenge into a blessing, start by seeing it as one and if you can’t, just let it go for a moment and find your inner strength and happiness by doing more of what makes you happy. Experiencing a bit of fear every now and then is a healthy response aimed to keep us safe. Learning something new can make us uncomfortable at first as it takes us out of our comfort zone. Doing new things makes life more interesting though and leads to growth. 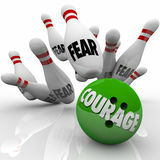 Courage is the best antidote to fear. Rather than focusing on what might go wrong, take a reality check. 90% of the things we worry about never happen, so why not focus on all the things that might go right? Think how great you will feel once you’ve conquered your fear? How will life be different? Who would be the first person to notice those changes? Focusing on a positive outcome increases the likelihood of positive things happening. Be your own best friend and give yourself a mental pep talk or imagine what a supportive person in your life would say to encourage you to conquer your fear. 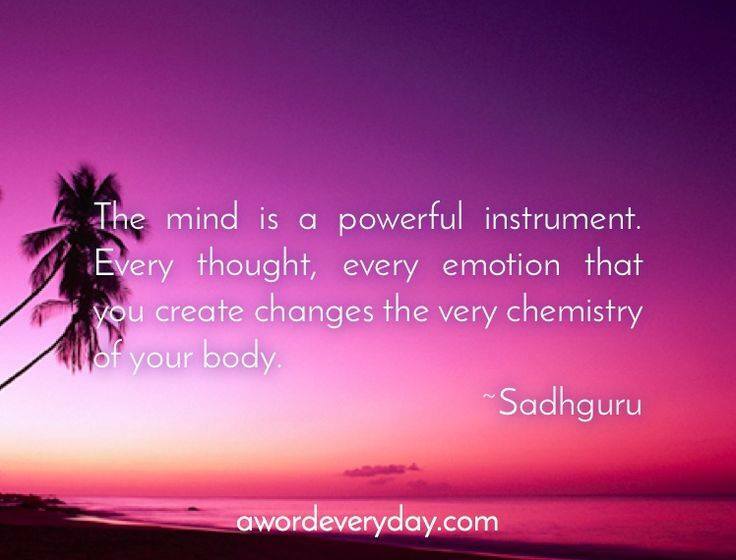 Did you know that you can choose your thoughts? So choose the ones that help you, not ones that drag you down. Easier said than done? Well, here’s a short cut: stop thinking for a moment and focus on positive FEELINGS! Who do you love most in life? What does this love feel like? Stay with that feeling for a couple of minutes and watch the changes in your body. 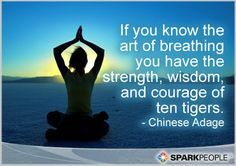 Another great way to conquer fear is to focus on your breathing! Breathe in slowly while counting to 6, then let go of the air slowly while counting to 6. Repeat several times and ‘watch’ the breath moving in and out of your body. Notice your chest and belly expand, perhaps put your hands on your body to feel this movement. These two simple techniques help to become present and to focus on the here and now. They work wonders before important meetings, job interviews, presentations or to calm down fearful worries. Some people may need healing on a deeper level, for example to overcome trauma, phobias or panic attacks. EFT tapping and Hypnotherapy are powerful tools to conquer these issues. These and other modalities are offered by a variety of practitioners (myself included). I’ve seen the most amazing changes in my clients. Don’t let your fear imprison you, set yourself free and start enjoying life. 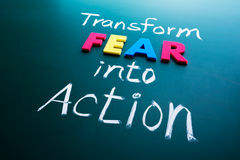 Turn your fear into action. 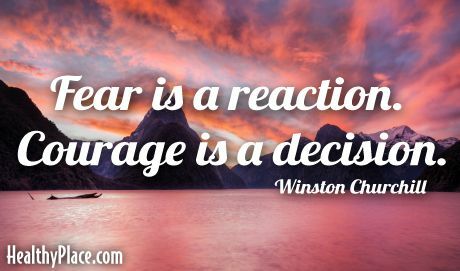 Like Winston Churchill said: ‘Courage is a decision’. Take your power back now! I’d love to hear if you’ve found this post helpful and look forward to reading your comments. Hello again. I hope you’ve had enough time to work on your SMART goal action plan (as described in part I) and to observe your potential excuses and limiting beliefs (mentioned in part II) that stop you from 100% following that plan and achieving your goal. Now, as promised, I’ll outline how to overcome those challenges to bring about the necessary changes to make this YOUR best year yet! Of course, not everybody has limiting beliefs that prevents them from reaching their goals. If you don’t and the action plan is working out for you, great! Keep going! The type of goal may also play a role, for example, a small goal might not bring up any resistance, while a big life-changing goal is more likely to be (self-)sabotaged, on an unconscious level of course. Nobody would purposefully get in their own way. Our unconscious mind is usually trying to keep us safe and if the new goal requires us to stand out, to make changes and take risks, a bit of resistance may come up, especially if we had some bad experiences in the past, and who hasn’t? Let’s now have a look at how to move beyond these limitations. Both EFT and Hypnosis are effective ways to overcome these (along with many other modalities that also work, these are just the ones I use and find extremely effective). Now, take out your answers from the questions in part II below. These reveal your hidden barriers which can be tackled with EFT tapping. EFT stands for Emotional Freedom Technique and is a unique modality to release negative emotions, such as fear or anxiety which often come up when thinking of reaching a powerful goal. So, read out your goal aloud and then tune into your body to see how it makes you feel. If any fear or anxiety comes up (or anything else that is not pure enthusiasm) then we’ve got something to work on. Rate the intensity of that feeling on a scale from 1-10 and see where it sits in your body, whether it has a form, shape or colour. For some people it could be something like a ‘tennis-ball sized black knot of anxiety in my stomach’. The more precise the description, the better EFT works, so please take a moment to really tune into that feeling and write down the number and details. Now, let’s get started. 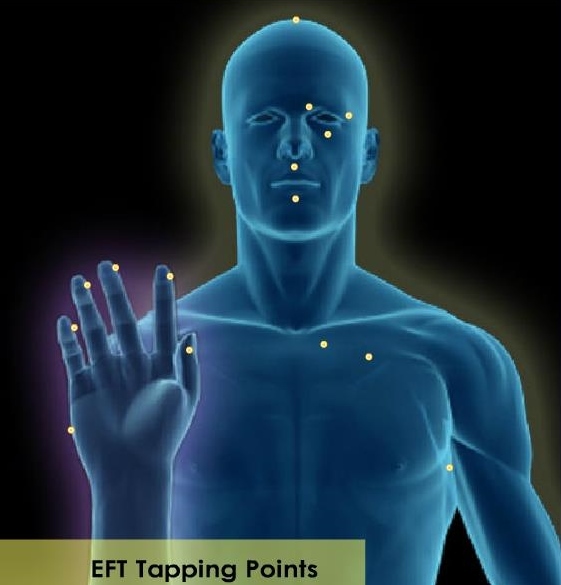 You can refer to the picture with the tapping points, if you don’t know them already or read the EFT page first for more information about EFT. We usually start with the so-called set-up statement which aims to tune you in as well as to acknowledge the feelings. Only if you can accept how you currently feel, you are able to shift this emotion. Set-up: Tap on the outside of your hand and say: ‘Even though I have this …[add your description] I accept how I feel and I’m ok.’ Repeat this a couple of times and make sure you focus on FEELING that emotion in your body while tapping. Tapping points: Start tapping slightly on the top of your head and repeat the so-called reminder phrase, e.g. ‘this tennis-ball sized black knot of anxiety in my stomach’. Then move on to the eyebrow point and repeat the statement. Again focus on the feelings and watch out for any changes. Tap through all the points while repeating the phrase or adapt it if the feeling changes. 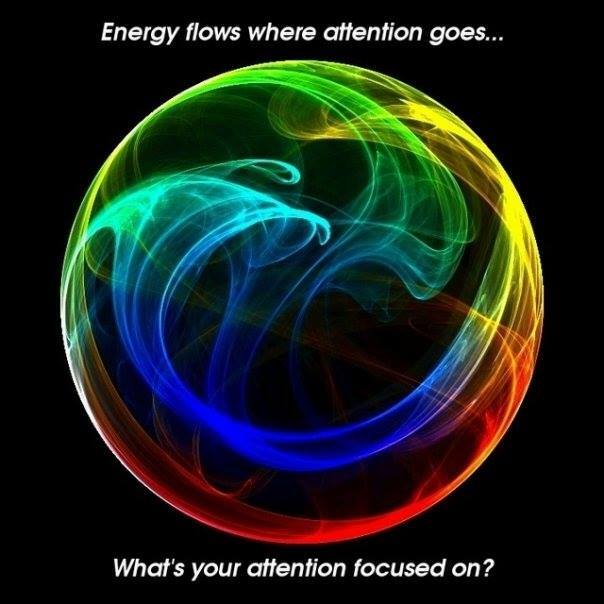 Also keep looking at your written goal to make sure you target the feelings related to this goal and not any other feelings that are currently in your energy system. After one or two rounds of tapping through all the points, measure the intensity on the scale again and see whether the colour, size, shape or location have changed. If so, you could do a second set-up statement, for example: ‘Even though I STILL have SOME of this …. [add your description]…I accept how I feel and I’m open to letting it go.’ Then tap through the points as described above. Continue until the number is very low or zero. Then look at the next question in part II and tackle those feelings in exactly the same way. If any memories happen to come up, keep those in your mind while tapping; imagine telling a friend what happened in that memory and tap until you can ‘tell’ the story without any negative emotions occuring. This helps clearing negative experiences from the past which may prevent us from reaching our goals. The whole process can take a while, so make sure you set enough time aside. It is important to be thorough and tap out all of this potential resistance. Remember if you overcome the resistance you will be unstoppable! It’s worth it, believe me! If you feel unsure, how to proceed or feel there’s too much coming up or you feel a bit overwhelmed with emotions, keep tapping until you calm down, then consider working with a qualified EFT practitioner who can help you shift quickly and safely. This is just a very simple introduction to EFT, there’s much more to it. Feel free to get in touch if you need any further information or assistance. I’m a qualified advanced EFT practitioner and trainer. In my next blog post, I’ll tell you a bit more about how to use hypnosis and visualisations to achieve your goals, yet first move beyond your limitations, fears and doubts. If this has been helpful, please leave a comment or get in touch if you’re interested in a session. I work in Brighton & Hove, East Sussex but also via Skype. 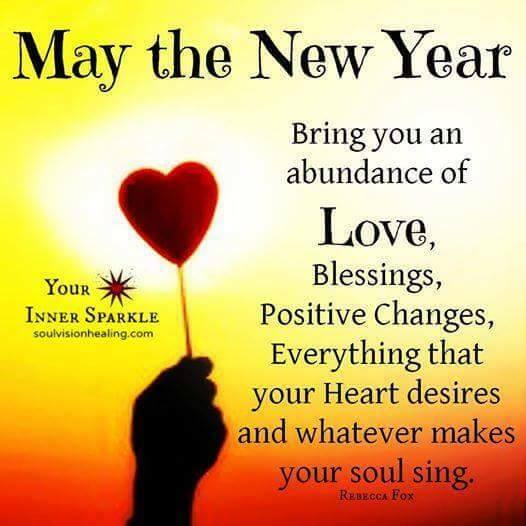 Best of luck with making this your best year yet! Let me know how you get on. How to make 2017 your best year yet – part II What’s holding you back? 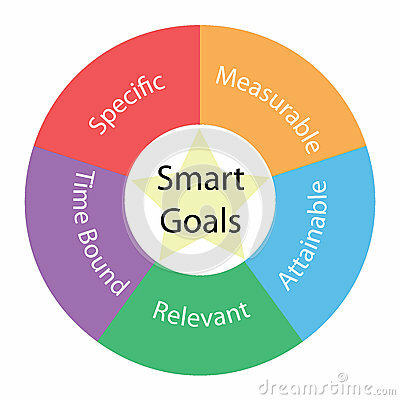 About 3 weeks ago I wrote about how to set goals and take action to achieve them using the SMART approach. If you haven’t read that article yet, catch up here. Today, the focus is on how to find and overcome limiting beliefs that lead to self-sabotage or procrastination. Have you taken action in the last few weeks? What have you done to work on your goals? Or have you simply not had time or forgot about it? Keeping busy and making other things and people more important can be a form of procrastination. If we have a clear goal, a step-by-step action plan and enough motivation to go for what we want, it should be easy to achieve our goals. Just get started, make daily improvements or contributions and over time, your goals will be realised. Simple, isn’t it? Then why do so many people never reach their goals? There are surely a variety of reasons (or excuses) but in my experience there is often an emotional element that holds people back, more specifically an emotion caused by certain thoughts or beliefs. For example, ask yourself: Do I really believe I can achieve this goal? If the answer is anything else than an immediate enthusiastic yes, there might be a bit of doubt that’s holding you back. Doubt leads to fear of failure and when fear takes over people tend to procrastinate or self-sabotage so that it eventually feels safer to not even try. 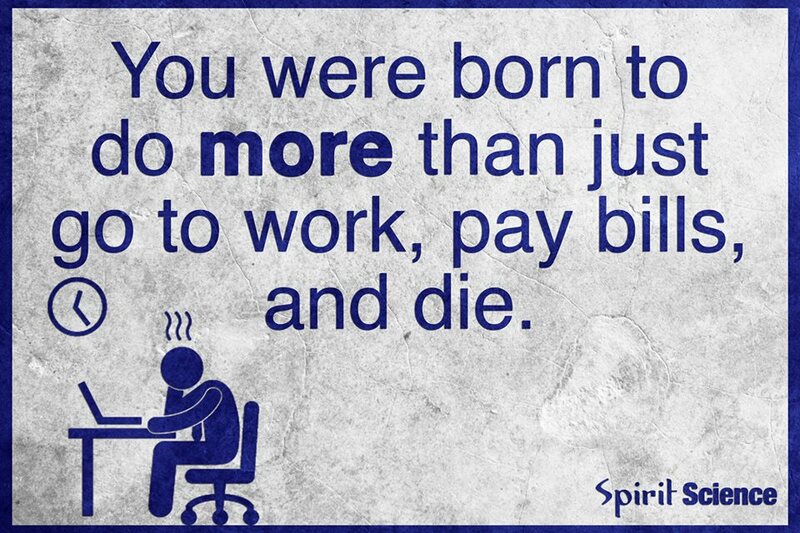 Or perhaps you do believe in your goal but are worried about what other people may say if you reached that goal? Could there be jealousy, disapproval or even pressure from others? Or maybe your goal involves becoming successful and standing out which can cause anxiety and doesn’t feel safe, so again fear interferes (on a subconscious level) and before you know it, you’ve only half-heartedly tried before coming to the conclusion that it won’t or didn’t work. Two great ways to overcome these limiting thoughts and feelings are tackling them with EFT tapping and/or Hypnotherapy. In fact, both work wonderfully together. With EFT (Emotional Freedom Technique) we can release doubts, anxiety and fear. These act as blocks in the human energy system but can be literally tapped away by applying EFT. Once these energy blocks are gone you will be clear and motivated and a massive step further on the way to reaching your goal. If you then follow up with Hypnotherapy, which is like a guided visualisation, where you vividly imagine having achieved your goal and how wonderful that will feel, you set your whole self (conscious and subconscious) up for success. You sort of become unstoppable. Right, so let’s see what’s holding you back. Take a piece of paper and a pen and answer the following questions. If possible rate each feeling that comes up on a scale from 1-10 (one being low and 10 being very high) and give any thoughts or beliefs a percentage between 1-100% in terms of how true it feels. 1. Write down your goal. Read it out loud and then pause and see how your body reacts. Do you feel enthusiasm or anxiety? Does it cause tension? Where is it in your body? Give it a number. 2. Do you believe you can achieve this goal? Give it a percentage! For example, I’m 70% sure I can reach this goal. If it’s anything less than 100% start exploring what’s holding you back. In the above example: what do the 30% stand for? Tune in and write it down. Is it a belief or a feeling? Name it and then rate it. 3. How would other people (friends & family) react if you achieved this goal? Be specific and write down what you think the most important people in your life would say, and more importantly how that makes you FEEL! In my next post, I’ll write about how to use EFT tapping to tackle those limiting thoughts and feelings. Make sure you have your list of thoughts and emotions and their numbers ready. Or if you want to start right away, feel free to contact me and book an appointment. I offer 1-2-1 EFT & Hypnotherapy sessions in Brighton & Hove, East Sussex or via Skype worldwide. Remember to enjoy every moment, smile more and be grateful for what you have already achieved. Please leave a comment and let me know if this post has been helpful. Thank you. It is January, time to set new goals and make changes. Here are a few tips and ideas how to go about this and how to make it happen! 1. A few useful questions: What would you like to achieve this year? What would need to happen to make 2017 your best year so far? Who/where would you like to be in 12 months’ time? 2. Become clear: Just for a moment travel into the future, imagine it’s December 2017 and you’ve lived your best year so far. What does that look like? And more importantly, what does that feel like? What achievements would make you really happy and proud in December 2017? Become clear on the goals that would have the greatest impact. Just choose between one and three. Close your eyes and do this right now! Take a few minutes to daydream….. Seriously, stop reading! Do this right now! 3. Great! Now write down minimum one and maximum three of the most significant goals. If you find it hard to choose, rate each on a scale from 1-10 in terms of impact on your life or happiness and use the one with the highest numbers. Again, please do this now. This is important to write them down. Go ahead, I’ll wait…. 4. Well done! Now, apply the (below) SMART checker to become crystal clear on your goal(s). Take a moment to do this. How much do you want to achieve this goal? Hopefully enough to take a few minutes out of your busy day to really work on those goal. A goal without a plan is just a wish! Make sure you goals are specific rather than general. For example: ‘I will exercise for minimum 30 minutes twice a week.’ is better than ‘I want to exercise more’ (more can’t be measured). M stands for measurable, so you need a specific number such as number of books you want to read, the exact weight you want to achieve or the duration of the daily meditation you’d like to do. The next letter stands for attainable or achievable, so your goal has to be something that you believe is realistic and possible to achieve within a certain time-frame. R refers to relevant which means that it has to be your own goal, relevant to you and your dream, rather than something somebody else wants you to do. Only if you really want to achieve that goal you can get the necessary motivation to take action. Finally, T stands for time bound. You need a deadline or final date by which this goal can be realistically achieved. That’s the only way to kick into action as without that you might be prone to procrastination or even forgetting that. The deadline is your commitment to achieve that goal by that time. 5. Winston Churchill said: ‘Those who fail to plan, plan to fail.’ So, with an end date in mind you can then start creating an action plan, a step-by-step approach to achieving this goal. Start by breaking it down into smaller steps, then attach a deadline to each of them. Ideally write a schedule or create a timeline and put it up somewhere visible as a reminder. Take small daily steps toward achieving your goal(s). Best of luck. Feel free to comment on this post or share it. 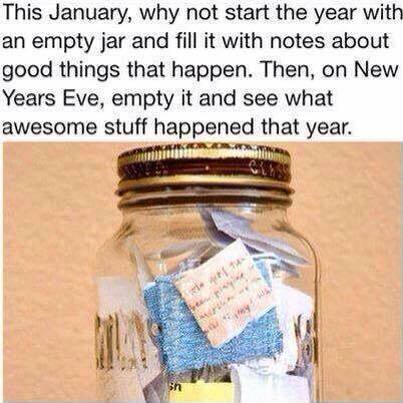 I found this last year and thought ‘what a lovely idea’. 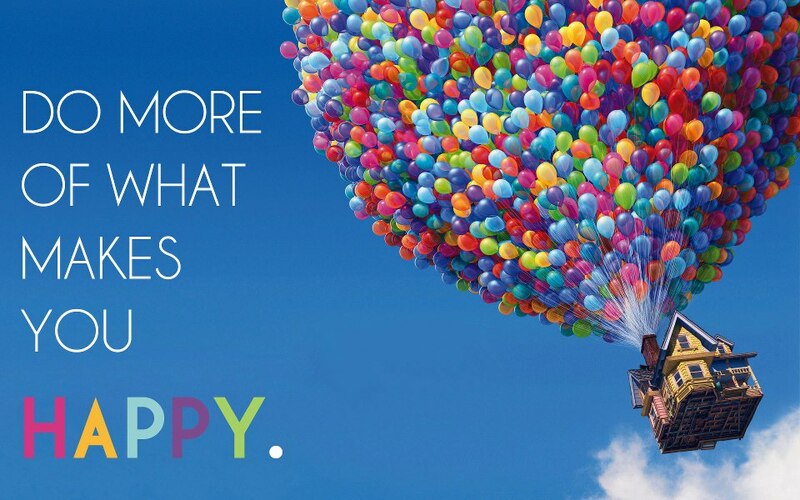 Swap New Year’s resolutions for a happy moment collection. It worked well for me and I’m doing it again for 2017. Many of us set lots of new goals and intentions at the beginning of a new year, only to give up a few weeks later. If you happen to be one of those who succeeds, well done! Keep going! This is just a very nice idea to set you up for happiness and focus on the good things that happen to you regularly. Love it! I don’t know about you but to me it feels that life is getting busier and busier. Technology is supposed to make things easier and faster, right? Yet I personally feel it provides more pressure (at times), e.g. being constantly available, texting, following and responding to friends’ posts and blogs on social media, being present online so that our friends can follow us, not to mention the pressure to do well at work, for our kids to do well at school and so on. I feel that some of my friendships only exist online. We hardly have time for face-to-face conversations anymore. Don’t get me wrong, I love social media (I’ve got this blog after all) I just don’t like it when it takes over and prevents us from switching off. The temptation is there, in every free minute, to check emails, new posts, pictures and videos online. Does this sound familiar? Well, I want to do something about this. I need more me time and have a feeling others do too. I need more emotional balance and a proper time-out from the fast moving busyness of this world. So I’ve started this new evening group. 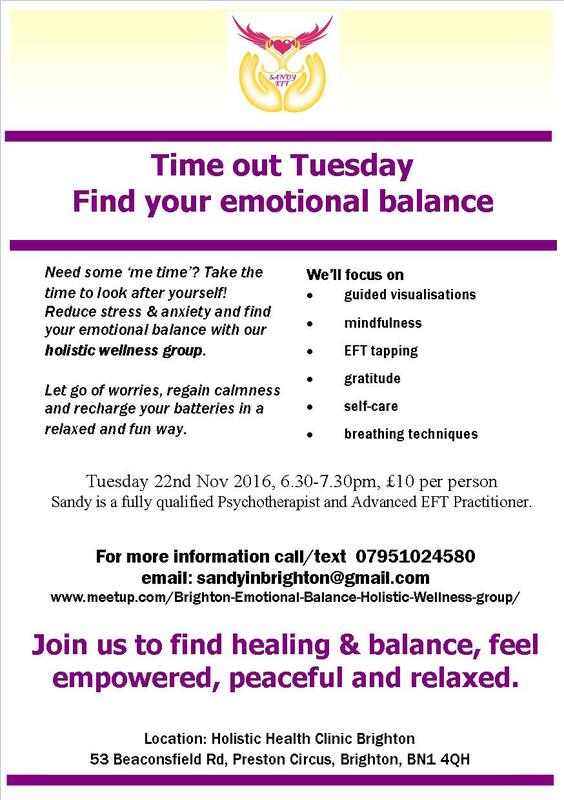 Time out Tuesday – Find your emotional balance and I’d like to invite you to join us, not online, but in person (if you are in South East England that is, Brighton&Hove area to be specific). My aim is to create a safe space for people to relax. 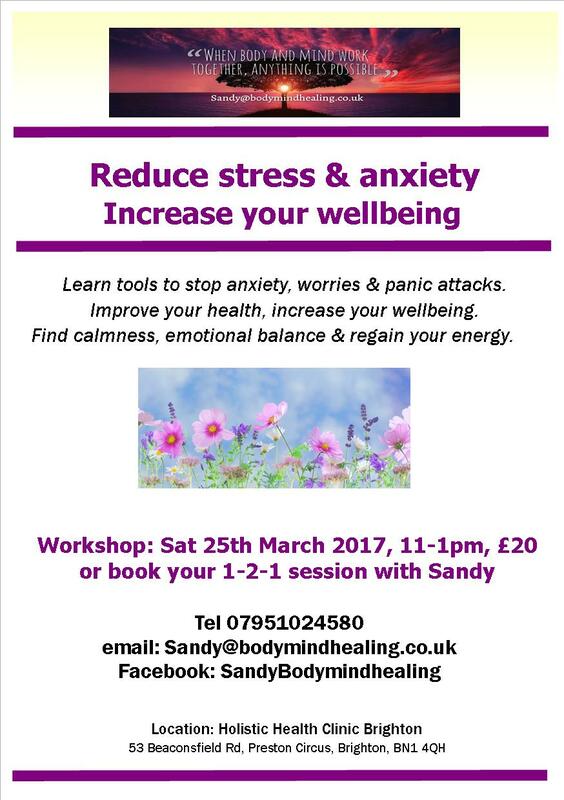 We’ll do some exercises, like breathing, gratitude and guided visualisations to let go of stress and worries and find more balance. Feel free to share this information with anyone who you think might be interested. Thanks. See you on Tuesday! Pain is one of the worst experiences we can have. Did you know that our reaction to it can make it worse or better? Our emotions and expectations play a major role in the level of perceived pain and its duration. 3 years ago I was suffering from a trapped nerve and had a frozen shoulder, I could hardly move and was in a great deal of pain. As I had had this condition several times before I panicked as I knew what to expect. This expectation, panic and fear made it worse as I felt helpless, angry and in despair. Yet as a trained EFT practitioner, I then used EFT tapping to address all my fears and emotions around this condition and experienced a remarkable relief. I wrote about this on my blog 3 years ago, you can read more about it here. Since then, I’m happy to say that the pain has not returned. While I used to get this at least twice a year before, it hasn’t happened at all in the last 3 years. One of the reasons may be that I’m now taking much better care of myself. I use EFT tapping regularly, I make sure I take time to relax and I listen to my body. When I notice the tensions in my shoulders worsening, I respond and honour my body, for example by taking the evening off, doing some tapping, visualising something positive or going for a massage. All symptoms in the body are just feedback. It’s important to befriend the body and work together to release any physical ailments. I now teach what I’ve learnt to others. I run weekly group sessionsand monthly workshops, such as my Time Out Tuesday group in Brighton or 1-2-1 sessions to help people release chronic pain and find inner peace.